Combine all ingredients for marinade in non-reactive container large enough to hold turkey. Remove turkey from packaging; drain. Remove neck and giblets; refrigerate for another use or discard. Rinse turkey inside and out with cold water, pat dry with paper towels. Place turkey in marinade. Cover container. Refrigerate 6 to 8 hours, turning turkey over occasionally. Remove turkey from marinade; drain; pat dry. Discard marinade. Place turkey on a flat rack in a shallow roasting pan, 2 to 2 1/2-inches deep. Tuck wings back to hold neck skin in place and stabilize the turkey in the pan and when carving. Brush lightly with vegetable oil or spray with cooking spray to prevent skin from drying. Insert oven-safe thermometer deep into the lower thigh muscle but not touching the bone. Bake 3 to 3 1/2 hours. When the turkey is about 2/3 done, cover the breast and top of thighs lightly with aluminum foil to prevent overcooking. Check for doneness about 30 minutes before end of recommended cooking time. 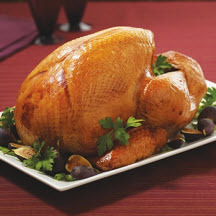 Turkey is done when thigh reaches 180°F (82.2°C) and juices run clear.